Managed care companies have always been big on patient satisfaction. There are a number of reasons for this the largest one being that they hope to replace medical approaches to healthcare with business approaches. That involves applying paradigms used in automobile manufacturing and customer service such as patient satisfaction surveys. It also involves applying business strategies to those surveys so that any particular business will look as good as possible when it is advertised. It is no accident for example that all the hospitals in your area are "five-star hospitals" or "highly rated" if the companies involved know how to game the system, the deck is stacked in favor of high patient satisfaction ratings. That can be done by combination of survey structure, survey timing, or scripting. During scripting the patient is exposed to a number of statements by a healthcare provider who has been trained in how to do this so that their statements closely match questions on the patient satisfaction survey. It is very difficult for a person to say they were never provided with information if they received carefully scripted information five minutes before they took the survey. Another advantage of patient satisfaction surveys is that they can be used as leverage against physicians. Managed care companies are always on the lookout for new ways they can reduce reimbursement to physicians. They already have an incredible amount of leverage with the so-called RVU-based compensation system but apparently that is not enough. In many cases a percentage of the physicians reimbursement is linked to patient satisfaction surveys. The more satisfaction, the greater the reimbursement. The irony is that in many cases, the money used for that incentive is a "hold back" or percentage of what the physician has actually earned. They will not get their full reimbursement unless they have adequate patient satisfaction ratings. The problem with that system should be obvious, but it was made even more obvious by a recent article in the Archives of Internal Medicine. In that study, the authors looked at a large sample of 51,947 patients over a timeframe of seven years. They focused on how their satisfaction ratings correlated with outcome measures. They found that the patients in the high satisfaction group had a 8.1% greater healthcare expenditure, 9.1% greater medication expenditure, and a 26% greater mortality risk. The most satisfied group was at less risk for an emergency department visit but had higher inpatient expenditures. The authors point out that patient satisfaction ratings correlate most highly with whether or not the physician fulfills the expectations of the patient. That could lead to a lower threshold for elective admissions to hospitals, more invasive testing, and less discriminatory prescribing practices. Their overall conclusion is that we do not know enough about patient satisfaction ratings and the implications for quality care. They make an excellent point about the need for physicians to discuss problem areas with patients “including substance abuse, psychiatric comorbidity, nonadherence, and the risks of requested but discretionary tests or treatments.” Those discussions may not be conducive to high patient satisfaction ratings. They also point out that these discussions necessarily take time. As I have previously pointed out, the time for discussions and clinics has practically been rationed out of existence. I thought that this was an excellent article overall that points out significant problems with business approaches to the practice of medicine. Rating a doctor like you would rate your car salesman creates a unique set of problems that businesses and the government have no interest in addressing. Ratings within healthcare organizations linked to physician "incentives" may be no more reliable than doctor ratings on Internet sites. Fenton JJ, Jerant AF, Bertakis KD, Franks P. The cost of satisfaction: a national study of patient satisfaction, health care utilization, expenditures,and mortality. Arch Intern Med. 2012 Mar 12;172(5):405-11. The scene between characters Don Draper and Peggy Olson in AMC TVs award winning show Mad Men (as in Madison Avenue) has an excellent bit of advice that I have tried to impart at times. In this scene, Peggy is in what appears to be a psychiatric hospital and she is bedridden. She has just gone through a major life crisis and tried to conceal her whereabouts from her boss Don Draper. Prior to this crisis she had impressed Draper to the point that he promoted her and he brings that up during this conversation. Draper on the other hand, had a similar life crisis when he was in his early 20s that involved changing his identity to the identity of a soldier he was serving with during the Korean War. He has a significant amount of psychological trauma from his childhood. His advice in this scene captures the way he has dealt with his own problems but also captures a larger thread of developmental psychology and speaks to the fact that as we deal with more crises through our lives it affects us less and and we can recover from it more quickly. That basic concept of resilience is not talked about enough in assisting people with crises in their lives. That should be obvious by anybody reading this post but it clearly is not. I have already established that there is a disproportionate amount of criticism of psychiatry in the popular media compared with any other medical specialty. The most common assumption of most of those critics is that psychiatrists are easily influenced by pharmaceutical companies or thought leaders who are working for pharmaceutical companies. There are many reasons why that assumption is incorrect but today I want to deal with a more implicit assumption that is that there is a drug that is indicated and effective for every medical condition. In the field of psychiatry this marketing strategy for pharmaceuticals became prominent with the biological psychiatry movement in the 1980s. Biological psychiatrists studied neuropsychopharmacology and it followed that they wanted to apply their pharmaceuticals to treat human conditions. At the popular level initiatives like National Depression Screening Day were heavily underwritten by pharmaceutical companies and the implicit connection was that you could be screened and be treated with a medication that would take care of your depression. From the perspective of a pharmaceutical company this is marketing genius. You are essentially packaging a disease cure in a pill and suggesting that anyone with a diagnosis who takes it will be cured. The other aspects of marketing genius include the idea that you can be "screened" or minimally assessed and take the cure. We now have the diagnosis, treatment, and cure neatly packaged in a patent protected pill that the patient must take. The role of the physician is completely minimized because the pharmaceutical company is essentially saying we have all the expertise that you need. The physician's role is further compromised by the pharmaceutical benefit manager saying that they know more about which pill to prescribe for particular condition than the physician does. That is an incredible amount of leverage in the health care system and like most political dimensions in healthcare it is completely inaccurate. The pharmaceutical company perspective is also entirely alien to the way that psychiatrists are trained about how to evaluate and treat depression. Physicians in general are taught a lot about human interaction as early as the first year in medical school and that training intensifies during psychiatric residency. The competencies required to assess and treat depression are well described in the APA guidelines that are available online. A review of the table of contents of this document illustrates the general competencies required to treat depression. Reading through the text of the psychopharmacology section is a good indication of the complexity of treating depression with medications especially attending to side effects and complications of treatment and decisions on when to start, stop, and modify treatment. Those sections also show that psychopharmacology is not the simple act that is portrayed in the media. It actually takes a lot of technical skill and experience. There really is no simple screening procedure leading to a medication that is uniformly curative and safe for a specific person. The marketing aspects of these medications often create the illusion that self-diagnosis or diagnosis by nonexperts is sufficient and possible. Some people end up going to the website of a pharmaceutical company and taking a very crude screening evaluation and concluding that they have bipolar disorder. In the past year, I was contacted by an employer who was concerned about the fact that her employee had seen a nonpsychiatrist and within 20 minutes was diagnosed with bipolar disorder and treated with a mood stabilizer, an antidepressant, and an antipsychotic medication. Her concern was that the employee in question could no longer function at work and there was no follow-up scheduled with the non-psychiatrist who had prescribed medication. Managed care approaches screening patients in primary care settings increase the likelihood that these situations will occur. The current anti-psychiatry industry prefers to have the public believe that psychiatrists and their professional organization are in active collusion with the pharmaceutical industry to prescribe the most expensive medications. In the case of the approximately 30 antidepressants out there, most are generic and can be easily purchased out-of-pocket. Only the myth that medications treat depression rather than psychiatrists keeps that line of rhetoric going. The recent mass murders in Afghanistan and the analysis of the events in the press highlight my contention from an earlier post that the press really does not do a good job in these situations. We can expect a continued exhaustive risk factor analysis and discussions by various pundits. The accused soldier clearly had a lot of exposure to combat stress, there is a history of traumatic brain injury, there is a possible history of substance abuse, and there are multiple psychosocial factors. So far we have seen the statements by people who knew him describing this event as completely unpredictable based on his past behavior. The debate will become more polarized as the lawyers get involved. The real truth of the matter is never stated. What we know about these incidents is more accurately described by anthropologists than psychiatrists or psychologists. The best book written on this subject is Lawrence Keeley’s War Before Civilization. In that book Dr. Keeley explores the contention that primitive peoples were inherently peaceful compared to modern man and a warfare that was waged was brief, fairly nonlethal, and stereotypic. In order to explore that theory, Dr. Keeley ends up writing a fairly definitive book on the anthropology of warfare. There are more lessons in that book about war and peace then you will ever hear on CNN or in the risk factor analysis that is produced in the popular media. So what do we know about the mass murder of civilians during warfare? The first thing we know is that it is commonplace. It happens in every war and no military force despite their level of training is immune to it. In prehistoric times, the most frequent scenario was a surprise attack on a village with the goal of killing as many inhabitants as possible. In Keeley's review, that number was generally around 10% of the population and that could have devastating consequences for a particular tribe including the complete dissolution. Keeley also makes the point that: “Only the "rules of war," cultural expectations, and tribal or national loyalties make it possible to distinguish between legitimate warfare and atrocities.” He gives the examples of Wounded Knee and My Lai as well as larger scale bombings of Hiroshima and Dresden. My Lai was a highly publicized incident from my youth. It occurred during the Vietnam War when the US Army massacred hundreds of Vietnamese noncombatants – largely women, children, and old men. In that situation, 26 soldiers were charged and only one was convicted. The convicted soldier served 3 1/2 years under house arrest. In addition to outright killing, mutilations of bodies and the taking of body parts as trophies continue to occur in modern civilized warfare in much the same way that these practices occurred in primitive warfare. Haley reported on a series of Vietnam veterans seen in psychotherapy and the special problems that exist in patients who have been exposed to or participated in wartime atrocities. Based on the literature at the time she suggested that the war in Vietnam resulted in a disproportionate number of atrocities. My current final analysis of the situation is that there are important social and cultural determinants of war and the inevitable wartime atrocities. Risk factor analysis and analysis of individual biology is very unlikely to provide an explanation for what occurred. The moral, legal, and political environment has changed since Vietnam and that is obviously not a deterrent. A comparison of the final legal charges and penalties in this case with what happened in Vietnam will be instructive in terms of just how far those changes come. If there is a conviction, there will be a lot of pressure to portray the convicted soldier as very atypical and probably as a person who underwent a significant transformation of his conscious state. There will be many theories. The idea that this transformation predictably occurs during warfare will not be discussed. I have already heard some experts talking about the thousands of soldiers who go though similar situations and seem to do just fine. The best approach to these events is a preventive one that includes minimizing the exposure to war instead of being involved in the longest war in American history. I don't expect that much will be said about that either. Lawrence H. Keeley. War Before Civilization. Oxford University Press, 1997. Haley SA. When the patient reports atrocities. Specific treatment considerations of the Vietnam veteran. Arch Gen Psychiatry. 1974 Feb;30(2):191-6. I sent an e-mail to one of my colleagues last night about a bill introduced in the state of Minnesota that would potentially allow managed care companies to replace inpatient psychiatrists with nonphysicians. She thought that was consistent with the managed-care model of high volume and low quality inpatient treatment. She also reminded me of the concept that inpatient units used to be a place where people came to heal. Over the years that I worked in inpatient settings it is apparent that severe psychiatric disorders take their toll and it takes a lot to recover. Many people are admitted with acute hypertension, dehydration, malnutrition and weight loss, tachycardia, acute blood loss, and any number of stressful physical conditions in addition to their primary psychiatric diagnosis. At least half of the patients admitted to the acute psychiatric inpatient units have been using alcohol, cocaine, or other intoxicants that worsen their physiological state. In some cases such as catatonia, the psychiatric illness alone is life-threatening. Before there were effective treatments some forms of catatonia had an 85% mortality rate. Not too long ago when we had more functional inpatient treatment people had time to recover. It was not uncommon to see patients with bipolar disorder take at least 2 to 4 weeks to recover from an acute episode. Inpatient psychiatrists and nursing staffs were experts in supportive care and patience invariably left the hospital in much better condition than they came in. That is no longer the case. Today the artificial pressure to make money restricts inpatient care to a number of days rather than weeks. That is well below the time frame that it takes for any of the known psychiatric medications to actually work. In the case of the patient with mental illness and substance abuse disorder, they may have only completed detoxification stage by the day of discharge. They leave the hospital in only slightly better shape than they came in. In many cases, their families were trying to assist them prior to admission and they discovered they could not help. I don't think that there should be any mistake that the current system is driven strictly by cash flow and the cash flow to psychiatry has always been limited. The business of managed care companies is not to give patients with severe psychiatric disorders the time they need to heal. The business of managed care companies is to make money and use any rationalization along the way to do that. Those currently include the idea that you should only be on an inpatient unit if you are acutely suicidal or aggressive. The other consideration is that the inpatient atmosphere should not be designed with patient comfort in mind, because we all know that if is too comfortable - somebody might want to stay longer than the system wants them to. Managed care companies had a different idea about treating depression not only in primary care settings but also in psychiatric clinics. In less than a decade the standard of care had devolved to the point where antidepressants were started on the initial visit and the standard outpatient follow-up was at one month. In addition, even though cognitive behavioral therapy was proven to be effective for the treatment of depression the standard course recommended in those research studies was never used. It was common then and even more common now for depressed patients to see a therapist and be told that they seem to be doing well after two or three sessions and there is probably no need for further psychotherapy. They typically did not receive the research proven approach. 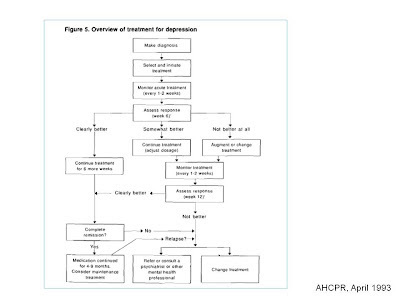 The latest innovation is to assess and treat depression in outpatient clinics on the basis of a PHQ-9 score, and have psychiatrists follow those scores and additional information from a case manager in recommending alterations in therapy for patients with depression. Although it was never designed to be a diagnostic or outcome measure the PHQ-9 is used for both. 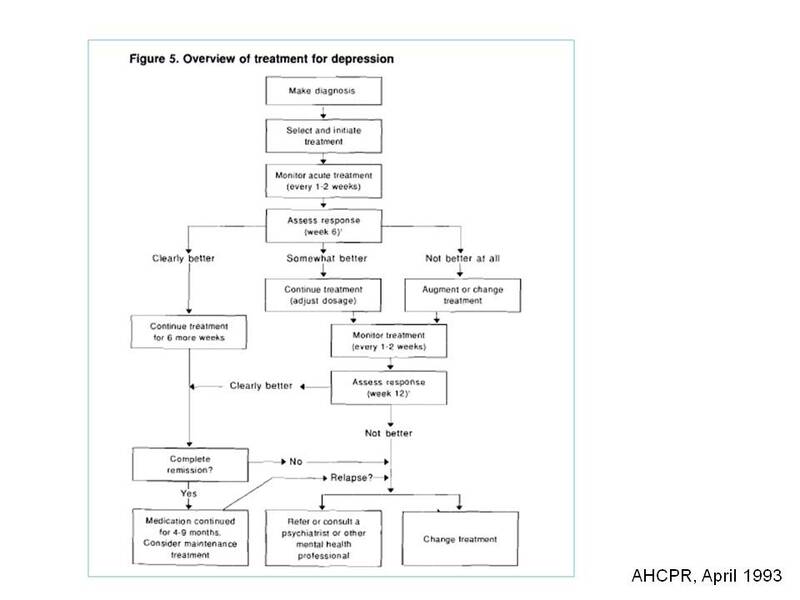 The current model of maximizing medical treatment of depression in managed care clinics is an interesting counterpoint to psychiatrists bearing the brunt of criticism for over treating depression with ineffective antidepressants. The recent FDA warning about prolonged QTc syndrome from citalopram is another variable that suggests there are potential problems in maximizing antidepressant exposure across a primary care population where the number of people responding to psychotherapy alone is not known but probably significant. There is another aspect of treating depression in primary care clinics that illustrates what happens when you think you are treating a population of people with depression. The new emphasis by politicians and managed care companies is screening for early identification of problems. The political spin on that is early intervention will reduce problem severity and of course save money. 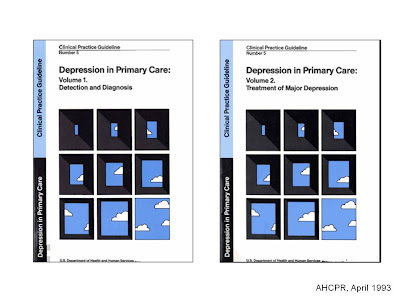 Various strategies have been proposed for screening primary care populations for depression. It reminds me of the initiative to ask everyone about whether or not they have pain when their chief complaint has nothing to do with pain. In the Canadian Medical Journal earlier this year, Thombs, et al, concluded that the evidence screening is beneficial and the benefit outweighs the potential harm is currently lacking and that study should be done before depression screening in primary care clinics is recommended. A recent op-ed by H. Gilbert Welch, M.D. in the New York Times is more accessible in the discussion of the risks of screening. The irony of these approaches to depression in primary care clinics can only be ignored if the constant drumbeat of managed care companies about how they are going to save money and improve the quality of care is ignored. Despite the frequently used buzzword of "evidence-based medicine" this has nothing to do with evidence at all. It is all smoke, mirrors and public relations. It makes it seem like managed care companies can keep you healthy when in fact they have all they can do to treat the sick and make a profit. That is the true end result when medical quality dies and politicians and public relations takes over. Thombs BD, Coyne JC, Cuijpers P, de Jonge P, Gilbody S, Ioannidis JP, Johnson BT, Patten SB, Turner EH, Ziegelstein RC. 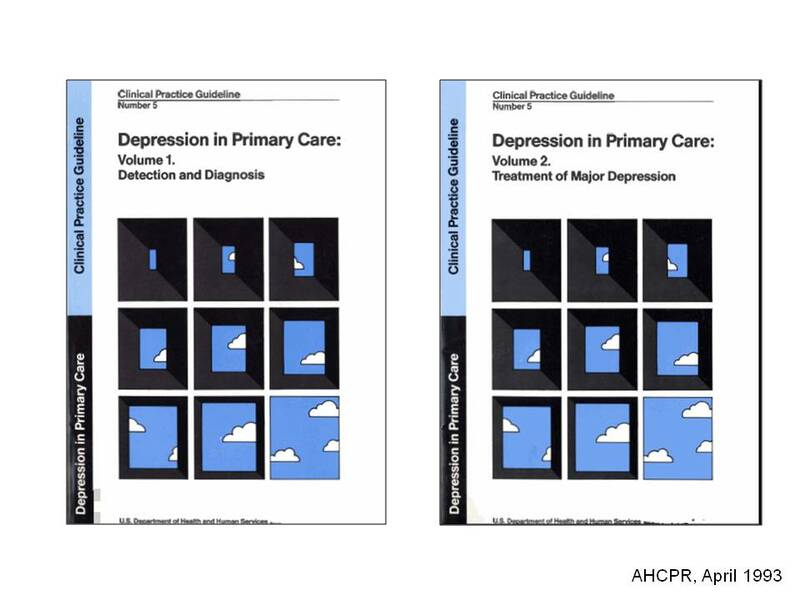 Rethinking recommendations for screening for depression in primary care. CMAJ. 2012 Mar 6;184(4):413-8. H. Gilbert Welch. If You Feel O.K., Maybe You Are O.K. NY Times February 27,2012. 1. Post the graphics and how they were produced as well as commentaries on the learning curve to use the relevant software. 2. Discuss issues relevant to using copyright material including slides that are now common in electronic journals. I am sure that more issues will crop up along the way. How Can Psychiatry Save Itself? Part 2. Ronald Pies, MD just published his second article in a two-part series on "How American Psychiatry Can Save Itself". This essay contains specific recommendations for change. I was surprised to see that it was written from the perspective of "the American public is disenchanted with psychiatry and how the profession needs to address these issues". He attributes the public relations problem to a number of factors including the lack of "robustly effective, well-tolerated treatments", ties to the pharmaceutical industry, the declining use of psychotherapy, the public's lack of understanding of current effective treatments, and essentially political attacks by anti-psychiatry groups and other sources. It is disappointing to see the formulation of the problem as basically one of public relations. Dr. Pies observes that the public really doesn't care about what was or what is in the DSM or the model that is used for mental illness. It is historically obvious that the only reason that psychiatry has been tolerated over the years has been our availability to treat people with obvious problems. It is difficult to deny that mental illness exists when you have brought your catatonic family member into the emergency department because they have not been able to eat or drink for two days. That fact alone is the reason that decades of anti-psychiatry abuse has been a nuisance but has not destroyed the profession. The main problems these days is that it has morphed into a brisk business for many of our detractors and whatever legitimate media is out there does not seem to be able to separate the wheat from the chaff. In the case of psychiatry there is an incredible amount of chaff. Dr. Pies has six fairly specific recommendations based on this public relations problem. I have listed them in table below along with my responses. This places him at a distinct advantage because I am in the position of reacting to his statements. I will offer my solutions further along in the article and hope for his rebuttal or the rebuttal of anyone else reading this article. 1. Change the name of the DSM to the Manual of Neurobehavioral Disease or MND. Another option would be Manual of Psychiatric Disorders. I generally avoid the term "behavioral" because it is a political term used by managed care companies to disenfranchise psychiatry or behavioral neurologists to suggest that they know more about human behavior than psychiatrists do. Every time we use the word "behavioral" rather than psychiatry we lose to somebody. Neuropsychiatry anyone? 2. Emphasize the importance of suffering and incapacity as hallmarks of disease and eliminate any condition that lacks those features. I don't think the DSM is that confused in the "Cautionary Statement" or "Definition of Mental Disorder" (xxi) when it describes mental disorders as "a clinically significant behavioral or psychological syndrome or pattern that occurs in individual and that is associated with present distress or disability or with a significantly increased risk of suffering death, pain, disability, or loss of freedom.” There are additional details. 3. Separating clinical descriptions of disease from research oriented criteria using prototypes for the clinical descriptions. This might be a useful public relations move but experienced clinicians already do this and there is some movement in DSM5 to already capture this, namely the elimination of schizophrenia subtypes. 4. Understand diagnostic categories as tools in the service of medical-ethical goals. I think that experienced clinicians also currently do this. 5. Biological data is regarded as supporting but not finding disease categories and the diagnoses would remain clinical. That is probably a state-of-the-art, but biomarkers may be fast approaching that can define more homogeneous categories of disease and more specific and successful treatments can be offered. 6. Parsimony with regard to the number of diagnostic categories. Agreed and at some point we should be able to use mechanisms of disease to parse the categories. A hopeful but at this point speculative example would be the role of the ventral tegmental area in both addictions and amotivational syndromes. From the opinions I have offered it should be apparent that I think this plan is a fairly weak one. In order to come up with a strong plan, the major problem affecting psychiatrists and the delivery of psychiatric services needs to be in clear focus. When I look at Dr. Pies suggested solutions he has public relations and the diagnostic manual in his focus. I suppose you could argue that public relations is always important and that the diagnostic manual is essentially a public relations nightmare particularly when you're considering the arguments of people who are not trained clinicians and who have their own agendas and are looking for easy press. I don't think the American Psychiatric Association has the resources to engage the thousands of anti-psychiatry and special interest groups who want to make headlines by critiquing the DSM5. In order to save American Psychiatry the problem needs to be clearly recognized. The single most destructive force to American Psychiatry without a doubt is managed-care and that includes managed care companies that are for-profit, managed care companies that are not-for-profit, pharmaceutical benefit managers, and government agencies that are using managed care strategies to ration psychiatric care. Within the space of two decades they have essentially shut down half of the inpatient bed capacity, they have turned inpatient units into high-volume and very low quality discharge mills, they have created a similar assembly line in outpatient clinics, they have added hours of free work from physicians frequently to justify their financial decisions, and they claim to be one of the great purveyors of quality treatment in medicine in the United States. How can that travesty possibly be ignored? All of the other threats to American Psychiatry pale in comparison. We have become a profession that is essentially defined by the managed care industry. 1. Managed care, pharmaceutical benefit managers, and managed-care tactics being applied by the government and government proxies need to be clearly identified as the problem. There needs to be a concerted effort to reverse the political and tactical gains made by this industry and most importantly reclaiming the quality ground. The managed care industry is currently represented by NCQA, and its role as an accreditation entity. Anyone who has looked at their standards for mental health care should be appalled. Every professional organization that has psychiatrists as members should be critiquing this organization and posting their own quality standards. 2. Professional psychiatric organizations need to maintain the edge in terms of quality and standard of care guidelines. We cannot afford to have guidelines that are 5 to 10 years out of date they need to be up-to-date and current. If the American Psychiatric Association is not up to the task, other professional societies should post current guidelines in their areas of expertise. You cannot possibly win political battles against an industry special interest group by using dated and incomplete guidelines and standards of care. An excellent example of psychopharmacology guidelines is available on the British Association of Psychopharmacology website. 3. The education of future psychiatrists is critical and that makes the issue of managed care and assembly-line psychiatry an even more immediate problem. We cannot possibly expect psychiatrists to train for an additional one or two years if they are going to be paid $22 or less to see a patient. There are not enough "medication management" visits in the world to fund for that additional training and a professional salary. Unless concrete changes occur in the practice landscape the future of current psychiatric training is at risk and there is no point in speculating on how it can be enhanced. 4. In the event that adequate funding is available for training and the future profession I would recommend changes in the total time of residency and psychotherapy training but in a different manner than that suggested by Pies. I would opt for adding a two-year neuroscience rotation and pool resources with departments of neurology and neurosurgery for a joint rotation to focus on the latest neuroscience applications to psychiatry, neurology, and neurosurgery. In the near future genomics and neuroscience will be required training and the associated philosophy can be taught at the same time during discussions of modeling at various levels. In terms of psychotherapy, the first thing that we can do is recognize the progress that has been made in residency programs as well documented in the Archives article by Weissman, at al. It was not that long ago that a number of "biological psychiatrists" were walking around and annoying the rest of us by proclaiming that "I don't do talk therapy". A psychiatrist trained in psychotherapy applies that continuously in their work and uses it to inform the structure of treatment. Some of the best psychiatrists that I have encountered do psychotherapy in as little as 10 or 20 minutes and the patients they saw during that time found those discussions to be very beneficial. Psychotherapy today can also be informed by the New England Journal of Medicine article written by Kandel over 30 years ago when he described how neuronal plasticity is affected by human encounters. The teaching of psychotherapy today can be used both as a technical tool to teach patients and a heuristic tool to teach staff and residents about human consciousness and its biological basis. Newer forms of psychotherapy such as Acceptance Commitment Therapy and Mentalizing therapy provide theories and an explicit roadmap and how to provide research proven and effective psychotherapy that takes human consciousness into account. 5. Political attacks by prominent government officials cannot be tolerated. It is no longer acceptable to suggest that all psychiatrists are corrupted because some psychiatrists are being paid to give presentations for drug companies or to do research. The suggestion that the DSM5 is corrupted, by ties to the pharmaceutical industry can be dealt with. There are clear strategies to deal with some of the blanket claims by Congressional critics. I can never understand how an entire profession became criticized because of the fact that some members were legitimately being paid to work by the pharmaceutical industry. I cannot understand how a member of Congress can decide to investigate private employment arrangements between an employee and employer or say nothing when no problems are found. I cannot understand how member of Congress with significant conflicts of interest is allowed to treat our profession with impunity when his conflicts of interest are never discussed. 6. Board certification has become a business that is rapidly aligning itself with the business of running medical boards and managed-care corporations. The goal of ongoing professional education should be to bring all practitioners up to the same standards and there is no reason that board examinations are necessary. There is no evidence that they can achieve that goal. This was clearly an arbitrary political decision by the American Board of Medical Specialties and it should not be tolerated by practitioners in the field. There is precedent for forming independent boards and I would refer to the American Society of Addiction Medicine as a clear example. If the ABMS, is no longer relevant - a better solution would be to form a new board that meets the needs of clinicians instead of purported political goals. 7. Quality based standardization of local practice is an attainable goal. One of the practical problems in any medical specialty is the fact that there are outliers. There is a robust solution to this and the best example I can think of is the Wisconsin Alzheimer's Institute Dementia Diagnostic Clinic Network. The network is a statewide collaboration of independent clinics that receive guidance and updates from a central university-based clinic specializing in the diagnosis and treatment of dementias. Patients anywhere in the state of Wisconsin or their physicians can refer to a local clinic to receive state-of-the-art diagnostics and treatment recommendations. This model solves two problems for psychiatry. The first is access to state-of-the-art psychiatric treatment and the second is practice drift by practitioners especially the outliers. It also solves a third problem of ongoing education. There is no reason why collaborative networks like this one could not be established for mood disorders, addiction, schizophrenia, anxiety disorders, and personality disorders. Training at all levels could be guided by the principle that psychiatric residents need to have the necessary skills to get into these networks and implement the guidance suggested by the central academic center. That is the path I would take to save American psychiatry. It is not an easy path but it is a realistic one. Any psychiatrist who has been practicing for the past 10 or 20 years realizes that the practice environment has deteriorated rapidly and despite all of the talk about a shortage of psychiatrists, the current lot of psychiatrists is being worked to death and they are trapped in a paradigm that results in high volume and low quality work. The main problem is that there is no foreseeable professional organization that can carry it out. The APA does not have the political will, expertise, or leadership to do it and in that regard the future does not look good. I think that also implies that the APA has really underestimated how far psychiatry has fallen and how much they have played a role in that fall. I see an occasional glimmer of hope, but as long as we have an ineffective structure and an election process that rewards academic achievement rather than a vision for psychiatry in the 21st century, progress will remain difficult if not impossible. We have already been replaced by a generation of "prescribers" in some areas and managed-care and the government would not complain if that occurred everywhere. Ronald Pies, MD. How American Psychiatry Can Save Itself: Part 2. Psychiatric Times March 2012, vol XXIX, No 3: 1, 6-8. Myrna M. Weissman; Helen Verdeli; Marc J. Gameroff; Sarah E. Bledsoe; Kathryn Betts; Laura Mufson; Heidi Fitterling; Priya Wickramaratne. National Survey of Psychotherapy Training in Psychiatry, Psychology, and Social Work. Arch Gen Psychiatry. 2006;63(8):925-934. Kandel ER. Psychotherapy and the single synapse. The impact of psychiatric thought on neurobiologic research. N Engl J Med. 1979 Nov 8;301(19):1028-37. When you are in business the goal is to make money. The interpersonal aspects of that continuum range from "The business of business is business" to "The customer is always right." An op-ed piece in the New York Times introduces us to another approach to making money and that is with the client or at the expense of the client. A Wall Street insider gives us a rare glimpse into one of the largest investment banking firms and how their culture shifted over the past two decades to focus on profiting from their clients rather than profiting with them. That same firm was already accused in 2010 of selling its clients mortgage-backed securities and betting against them. A professor of corporate governance from the University of Delaware commented about how the structure of these companies changed as they became public and started to look for as many clients as possible. For the same period of time the change in corporate governance of healthcare corporations has also gone through a revolution. There has been a shift from medical guidance to business guidance. Many if not most clinics and hospitals have changed their corporate governance so that doctors are subordinate to businessmen. The changes are often very subtle but the overall process has a focus on making money rather than optimal patient care. There is plenty of window dressing along the way that is frequently sold as quality but the bottom line is that any physician or patient will generally sustain some kind of significant cost dealing with a healthcare corporation or pharmacy benefit manager. When physicians are taken out of the loop, the business of medicine is no longer treating illness and alleviating suffering but it becomes making money and the only way that happens is to profit from patients and get as much free work as possible from doctors. Nelson D. Schwartz . A Public Exit From Goldman Sachs Hits at a Wounded Wall Street. New York Times March 14, 2012. Greg Smith. Why I Am Leaving Goldman Sachs. New York Times March 14, 2012. The New York Times has a feature (see first reference) that discusses why the number of Internet reviews of physicians is sparse and the quality is poor. The main contention is that people are too intimidated to rank physicians. The author ignores the profit motive of all the sites as a potential conflict of interest and leaps to the conclusion that the AMA speaks for most physicians even though only about 29% of physicians are members of the AMA. He also describes physicians as "untouchable" when in fact at least 20% of physicians can be expected to be sued for malpractice during their lifetime and malpractice lawsuits have resulted in entire specialties migrating from a particular state. That is hardly what I would describe as "untouchable". He is openly critical of the president of the AMA suggesting that anonymous, undocumented, and unverified reviews are probably not the best source for a physician recommendation. He quickly invalidates "disproportionately positive reviews" on some websites is the product of an "unquestioning mindset". The worst part of the article is leaping ahead to the Medicare initiative and their physician report card. Nevermind the fact that the risk adjustment concern by the AMA is legitimate. Nevermind the fact that there is really no valid way to compare physicians at this point in time. Nevermind the fact that there are political interests at play in particular the managed-care industry and how they can potentially game the system in favor of their principles. The author basically is encouraging people to go full speed ahead. The result of that experiment is fairly predictable. The only thing I am hoping is that Google will come up with a way to prioritize the relevant information about physicians such as where they really practice and how to get a hold of them instead of the pages and pages that you currently encounter when you are trying to find a physician. The AMA doesn't give much better advice in their recent edition of the amednews. In a piece entitled "Physician rating website reveals formula for good reviews", their first suggestion was to not have a patient waiiting for more than 15 minutes and no more than 10 minutes in the exam room. I can't think of any practice where the physician has that kind of control over their schedule - even if they postpone all of the documentation and stay for several hours after the clinic closes to get it done. The business experts observed: "overall ratings were based on time in the waiting room and the exam room -- rather than perceived clinical quality". Keep that in mind when you are looking at online ratings of physicians. I would suggest an experiment of my own that I have conducted several times with a high degree of success. Imagine that you have a serious medical condition that requires a high risk procedure and you want to find the best physician to help you. Your search process will involve the Internet, but it does not involve looking at any of the ratings you find when you search on a physician's name. What do you do? I will come back and answer that at a later date and discuss how that needs to be modified when you are looking for a psychiatrist. In a previous post, I discussed Drucker's concept of “knowledge workers” and how that concept applied to psychiatrists and physicians. The basic concept is that knowledge workers know more than their managers about the service they provide, work quality is more characteristic than quantity, and they are generally considered to be an asset of corporations. I pointed out that physician knowledge workers are currently being managed like production workers and referred to common mistakes made in managing physicians and psychiatrists. Today I will tell attempt to describe how some of that mismanagement occurs using examples that psychiatrists have discussed with me over the past several years. Inpatient psychiatry has taken a severe hit over the past 20 years in terms of the quality of care. Many people have talked with me about the discharge of symptomatic patients occurring in the context of high volume and low quality. Depending on the organization, a psychiatrist may be expected to run an outpatient clinic in addition to a busy inpatient service or in some cases provide all the medical services to the inpatients with minimal outside consultation. Most hospital care is reimbursed poorly despite political suggestions to the contrary. Psychiatric DRGs are typically 20% less than medical surgical DRGs and they are not adjusted for complex care. Administrators generally "manage" psychiatrists in a way to make sure that inpatient beds are covered. That frequently means that psychiatrists who prefer practicing in an outpatient setting end up doing some inpatient care. An outpatient clinic may be canceled so that a psychiatrist is available to run an inpatient unit. There have been situations where inpatient beds or whole units have been shut down for lack of psychiatric coverage. The only explanation given is that there is a "shortage" of psychiatrists. I had the pleasure of running into one of my residency mentors in an airport last May. I let him know that I was just finishing up 21 years of inpatient work and moving on to something else. He smiled and said: "Three months wasn't enough?". I always liked his sense of humor but there is also a lot of reality in his remarks. I don't mean to imply that it is any easier on the outpatient side. If you are a manager, what could be easier than having a unit of production that you could hold your employees to? It turns out there is something easier and that is being able to set the value of that unit of production. That is what RVU based productivity is all about. A standard managerial strategy these days is to have a meeting with an outpatient psychiatrist and show them how much they are "costing the clinic" based on their RVU production. Spending hours a day answering phone calls, doing prior authorizations, questions from other clinicians, curbside consultations, discussions with family members, and documenting everything doesn't count. I have had the experience calling a clinic at 7 PM and hearing keyboards clicking in the background. I have asked outpatient colleagues how they are able to produce outpatient documentation themselves and still get out of clinic on time. Now that I work in an outpatient setting myself, I know what they were telling me was accurate and that is the documentation gets deferred until later. The mismanagement does not stop there. At some point in time medical schools decided that there were also going to start basing faculty salaries on clinical production. I suppose every medical school as a formula for converting teaching and research time into production units, but until I see those formulas my speculation is that any activity that does not result in billing leads to lower compensation. The days when physicians were hired as teachers and academicians seem to be gone. Because of discriminatory reimbursement, departments of psychiatry will be disproportionately affected. Within psychiatry there used to be an interest in organizational dynamics and how they impacted patient care. The dynamics in most organizations today are set up to promote the business. That has produced a focus on high volume-low quality or in some cases supporting the specialty with the highest reimbursement and procedure rates. Associated dynamics are in place to select and shape an idealized corporate employee who will modify his or her practice according to the whims of the Corporation. It may be hard to believe but large medical corporations everywhere are trying to figure out how to recruit young physicians who believe in their models. Physicians who don't accept these ideas frequently find that the company is not very friendly to them. There are always various political mechanisms for ousting any dissidents and there is minimal tolerance for debate. The dissent can be as mild as asking why consultants with less expertise than the physicians in the practice are being called in to critique them and come up with a plan. When it comes to physician mismanagement there are few businesses that can equal the government. RVUs, the Medicare Physician Payment Schedule, pay for performance, and various failed political theories like fraud as the cause for healthcare inflation, and managed care amplifying all of the above and focusing all of that irrational management directly on physicians. The result is obvious as enormous inefficiencies, job dissatisfaction, and demoralization. Governments partnering with businesses and placing business practices like utilization review and prior authorization in state statutes increases the burden exponentially. At the heart of this conflict is a physicians training to be a scientific critical thinker and function autonomously with the businesses interest of making a buck. Despite all the lip service to quality, business decisions are always made on a cost rather than quality basis. It is often difficult to see any light through the blizzard of government and business propaganda that passes for the management of physicians and psychiatrists. Psychiatry has bore the brunt of mismanagement over the past 20 years and that has well been well documented in the Hay group study showing the disproportionate impact of managed care on our field. Inpatient bed capacity has dwindled and the beds that have not been shut down are managed for high-volume low quality work. Outpatient clinics including those run by and nonprofits are managed according to the same model. Businesses and governments have provided the incentives for this type of practice. The available consultants in the field only know an RVU based productivity model and nothing else. Rather than treating psychiatrists as knowledge worker assets, the available jobs frequently reduce us to micromanaged clerical workers utilizing about 10% of our knowledge. It should be no surprise that the environment makes it seem like anyone can do the job. One of my favorite quotes from Peter Drucker was: "More and more people in the workforce and mostly knowledge workers will have to manage themselves". After all, only the knowledge worker knows how to best complete the job. Every psychiatrist that I know, knows how to get the job done and it is often at odds with what we are allowed to do. The best pathway to do this is to optimize the internal states of the knowledge workers and create environment where they manage themselves. There are very few environments available where that can happen today for psychiatrists. The Board of Medical Practice in the state of Minnesota regulates 20,000 physicians. Most of them are employees in large healthcare companies. That means they have to undergo the credentialing process within those organizations as well as collateral organizations in addition to renewing their state license every year. There are about 800 complaints against physicians with the board of medical practice every year and the board takes serious actions based on those complaints at the rate of about 1.29 serious actions per 1000 physicians. In Minnesota, anyone can complete a formal complaint against any physician. A specialist at the board sends a letter with the complaint to that physician's office and they have two weeks to respond to the complaint. That generally involves a specific letter to address the complaint as well as all of the associated medical records. Frequently several physicians or clinics are part of the complaint in the process cannot go forward until all of the responses have been received by the Board. The physician must respond literally to the complaint as written by the complainant. The complaint is never interpreted by the Board. The Board renders a decision based on the information it receives. Like many states there is a move by politicians and the news media to suggest that doctors are not regulated tightly enough and they are not punished thoroughly enough in the state of Minnesota. The local press has been beating that drum for the past month. There is now a clear case to be made that some of these complaints have little to do with medical practice and more to do with politics. Many of us have seen it happen to our colleagues. I am familiar with several cases where a physician was accused of having a problem with other staff. The descriptions of those problems varied from being "disrespectful" to "snubbing" another staff member. Even in the case of unsubstantiated complaints there are protocols available in the Twin Cities that allow for physicians to be fired, written up, or rehabilitated based on purely subjective complaints. That is a far cry from the concerns about "disruptive physicians". It is apparent that in many settings purely subjective and essentially political complaints are being made on physicians and advanced by their administrative hierarchies. Before anyone plays the "you're just defending physicians" card consider this. There is no physician I am aware of who would not agree with disciplining a physician who is physically abusive, verbally abusive, or otherwise out of control. There is no physician I am aware of who wants to see an incompetent physician practicing anywhere regardless of the source of their incompetency. The people who escape criticism in the issue of physician discipline are not physicians but anyone who stands to gain from the proposition that there continue to be physicians who endanger public safety and there are widespread undetected numbers of them out there practicing. Clearly the media has a stake in this process. The letter by Dr. Langland points out that the media in this case certainly could have done a better job investigating the major points of their contention that the medical board is failing in its public safety mandate. At a national level, Public Citizen obviously has a lot to gain by its ranking of medical boards and suggesting that ranking has a lot more meaning than it really does. Politicians at all levels get a lot of mileage out of keeping professionals accountable. That is true whether they are teachers or physicians. The irony is that politicians at all levels are clearly some of the least accountable people out there. I have also posted clear evidence that their approach to holding teachers "accountable" with an emphasis on standardized test score results is exactly the wrong approach to improving student test scores. This is a rather stunning revelation. It suggests that some organizations that are punishing physicians for what are essentially subjective or political complaints are also filing those complaints with the Board of Medical Practice and looking for them to be legitimized. While it is good to know that the current board has been able to see those complaints for what they are, there is no guarantee that will always be true. With the increasing influence of businesses and their agenda to control doctors, at some point in the future we may see these trivial complaints suddenly become complaints that threaten a physician's license and livelihood. That is a heavy price to pay for the cost of doing business. 3. Medical Board actions against doctors, per 1,000 doctors, 2010. StarTribune February 6, 2012. 4. Glenn Howatt and Richard Merryhew. State panel: Public deserves more information about physician misconduct. StarTribune February 27, 2012. 5. Glenn Howatt and Richard Merryhew. Doctors who err escape penalties. StarTribune February 5, 2012. 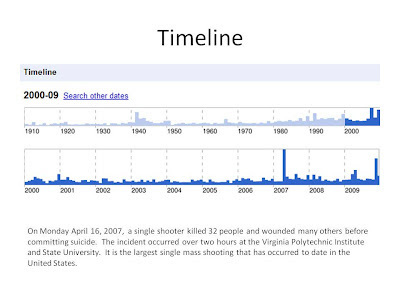 Mass shootings have been a phenomenon of my lifetime. I can still clearly remember the University at Texas-Austin shootings that occurred on August 6, 1966. A single gunman killed 16 people and wounded 32 while holed up on the observation deck of an administrative building until he was shot and killed by the police. I first read about it in Life magazine. All the pictures in those days were black and white. 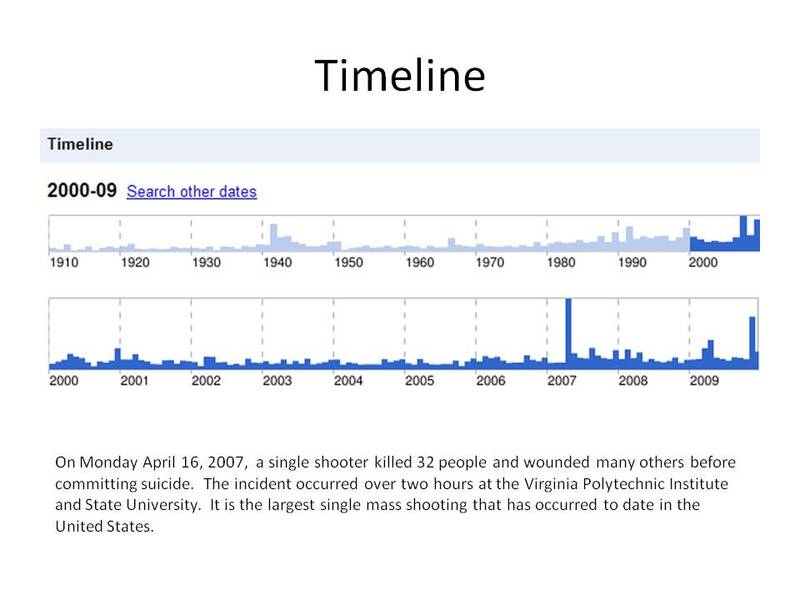 Some of those pictures are available online on sites such as "Top 10 School Massacres.” I generated this timeline of mass shootings when Google still had that feature in their search engine. The problem of course is that the mass shootings never really stop. In the USA, the press is so used to them that they seem to have a protocol. Discuss the tragedy and whether or not the perpetrator was mentally ill, had undiagnosed problems or perhaps risk factors for aggression and violence. Discuss any heroic deeds. Make the unbelievable statement that the victims were "in the wrong place at the wrong time." And then move on as soon as possible. There is never a solution or even a call for finding one. It is like everyone has resigned themselves to to repetitive cycles of gunfire and death. It is clear that the press does not want to see it any other way. When you are practicing psychiatry especially in emergency situations and hospitals, you need to be more practical. When I took the oral boards exams back in 1988 and subsequently when I was an examiner, one of the key dimensions that the examiners focused on was the assessment of dangerousness. Failing to explore that could be an exam failing mistake. Any psychiatric inpatient unit has aggression toward self or others as one of the main reasons for admission to acute care and forensic settings. With the recent fragmentation and rationing of psychiatric services, many people who would have been treated in hosptials are diverted to jails instead. That led one author to describe LA County jail as the country's largest psychiatric facility. I have introduced the idea of looking for solutions into professional and political forums for over a decade now and it is always met with intense resistance. Some mental health advocates are threatened by the idea that it will further stigmatize the mentally ill as violent. Many people consider the problem to be hopeless. Others see it as the natural product of a heavily armed society and no matter what side you are on that argument - that is where the conversation ends. In an attempt to reframe the issue so that this impasse could possibly be breached the Minnesota Psychiatric Society partnered with the the Barbara Schneider Foundation and SAVE Minnesota in the wake of a national shooting incident to suggest alternatives. Rather than speculate about psychiatric disorders or gun control we were focused on solutions that you can read through the link below. The actual commentary was never published by the editor who apparently stated that there was a conflict of interest because we seemed to be fishing for research dollars. It appears that the press can only hear the cycle of tragedy, speculation about mental health problems, and the need to move on. The problem with that is that we continue to move on to another shooting. "The land of 10,000 90862s"
The title of this post is an inside joke for psychiatrists. 90862 is the billing code associated with a psychiatric visit that is commonly referred to as the "med check." It is an example of what can happen to a profession when government bureaucrats and businesses run amok in determining what they think you do or what you should be doing when you provide patient care. I first became aware of the political importance of this system in the 1990s, when I had to attend mandatory billing and coding seminars at my place of employment. In those seminars I learned that the politicians and insurance companies were so desperate to use this arbitrary system that they told us we could go to federal prison for a long time if we submitted a "fraudulent" billing document. The "fraudulent" document they were talking about was any bill connected to the document of a patient encounter that did not have enough bullet points to qualify for that level of billing. That is an important concept so let me say it another way. After every patient encounter, the physician needs to document a note about what happened and indicate a level of billing for that encounter. When I first started training the note could be as little as one or two lines. For example, at one point in my training I covered an entire surgical service with a team of doctors. We could round on 25-30 patients with very complicated problems and write all of the documentation in about 2 hours. The documentation was "Pain is well controlled, surgical site looks good, vital signs are stable." We did not have to bother with any billing documents because a hospital billing specialist came by and confirmed that we had seen the patient and submitted the bill. Somewhere in the 1990s, a government initiative changed all of that. The government decided that they needed a way to control the global budget for physician salaries and they decided to develop a system of codes for patient encounters that they assign relative values to and then multiply that by a certain number to set reimbursement for that code. The entire system rests on the assumption that somebody can look at the description of a patient encounter as written in a note and audit the associated billing document. It turns out that when this assumption was tested several years later - it was determined to be false, but that did not deter the federal government or the health insurance industry (see reference). The 90862 is probably the most abused billing code in the psychiatric profession. The interpretation of what constitutes an encounter that qualifies for this code varies from practice to practice and between organizations. Patient experience varies from literally talking to a psychiatrist for 5 minutes with the goal of getting a prescription refill to a much richer encounter that includes a discussion of other current problems, additional medical diagnostic discussions and psychological advice. In some cases, acute medical problems requiring emergency care have been identified in these sessions. There is no doubt that a considerable amount of gaming occurs on the part of some clinicians and most insurance companies and government payers. The only gaming possible by the clinician occurs at two levels. The first is total time spent with the patient. The folklore is that these are all 15 minute encounters. Some clinicians insist on seeing patients in half hour blocks and others see 3 - 4 people per hour. The second is total documentation. You can literally do a few lines or you can write several paragraphs and stay after work just to do the documentation. A lot depends on whether you think you will be audited and somebody will be making an arbitrary decision about whether your note qualifies for the charge that you assign to it. There are myriad ways that a managed care company can game the system. First of all, they can assign any level of reimbursement to any billing code that they want. I quoted a New York Times article in another post as saying that a psychiatrist could see three patients for medications and get reimbursed at $50 per session, but the actual reimbursement can be less than half of that. That same managed care company can also take any bills submitted for patient encounters with higher reimbursement levels and say: "we are only paying you for a 90862 no matter what you do." If you happen to be working in an institutional setting, a managed care company can negotiate a per diem rate with your employer and not pay the 90862 billing at all. Stated another way, a psychiatrist can see a patient with complex medical and psychiatric problems and get reimbursed at a level that might lead to them break even - to getting no reimbursement at all depending on the insurance company and contracting arrangements. Within organizations the relative values for these codes are the basic way that physicians are manipulated to see more patients. It is referred to as their "productivity" even though producing work for little or no reimbursement is not really productive activity. The physician managers can demand that they see more and more patients to compensate for the poor or nonexistent rate of reimbursement by managed care companies. Another artifact of this system is that procedures like surgeries, endoscopies, and angioplasties are reimbursed at a higher rates than a doctor talking with you and discussing the diagnosis and treatment. That lead to a movement to reimburse the cognitive or nonproceduralist specialties at higher rates. But given the amount of government payer and insurance company leverage it is impossible to make that happen. Is there a solution to this problem that in effect makes physicians work impossibly harder to earn a professional salary? The solution is as easy as considering how I pay my attorney, accountant, mechanic, plumber, electrician, and chimney sweep. I pay them all by the hour. In some cases there is an agreed fixed amount, but it is generally many times more than what I would get reimbursed for the lowest 90862 reimbursement. Getting back to the title of this post, when I looked at the lowest current reimbursement for a 90862 and calculated how many of those bills would need to be submitted to make a professional wage, it came out to about 10,000 patient encounters per year. Working 50 weeks per year that would mean seeing 40 established patients per day. The only clinic where I have ever observed those numbers had three nurses rooming the patients and doing all of the documentation before they were briefly seen by a psychiatrist. As I contemplated all of this I had the thought: "I am living in the 'Land of 10,000 lakes' - maybe we should just change that to the 'Land of 10,000 90862s.' "